Natural organisms are so attuned to their habitat that virtually anything we add to the environment will have a detrimental effect. The more harmful pollutants are those that tend to remain unchanged in some damaging form, and those that are effective in low concentrations; some combinations of pollutants can also be unexpectedly lethal. On the other hand, if a specific pesticide is used by many people, it may be cumulatively more detrimental to wildlife than if a variety of pesticides is used. Substances that degrade the aquatic environment. Sediment covers spawning gravel, and can reduce plant photosynthesis. Plant fertilizers and the phosphates in some detergents over-stimulate the growth of aquatic plants, that, on dying, deplete the oxygen supply available to fish. Decomposing garden clippings also consume dissolved oxygen. Substances that quickly make life unsupportable. Oil and grease destroy the ability of fur and feathers to trap an insulating air layer, and they prevent insects from breathing. Sediment can clog the gills of fish. Substances that have a physiological effect. Salt water intruding freshwater habitat, may reverse the flow of liquid across body membranes. Lead and many pesticides debilitate the nervous systems of animals and insects. Detergents irritate the gills of fish; they can be lethal even at low concentrations. Substances that upset animal metabolism. Chlorine from swimming pools is transformed in the environment into carcinogenic dioxin. Heavy metals from paint, car batteries and brake pads accumulate in organisms low in the food chain, and cause debilitating sickness in higher species. Some substances disrupt the immune system of animals. Substances that undermine the reproductive system. Selenium deforms fetuses. DDT makes birds’ egg shells so fragile that they break in the nest. Medicinal hormones survive sewage treatment and can then disrupt fish reproduction. Insecticides and herbicides (including swimming pool algaecides) may continue to be lethal when they reach the creek corridor. The elimination of microscopic organisms low in the food chain affects fish and animals that feed upon them. 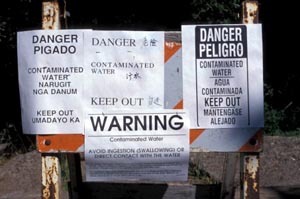 Pesticides survive sewage treatment operations, so they should not be poured down the sink. Bacteria and pathogens from sewer leaks, malfunctioning septic systems, and animal waste can spread disease. In the creeks of our watershed, most of the pollutants come from surfaces exposed to stormwater runoff: roofs, streets, sidewalks, driveways, parking lots, business properties, lawns, and gardens. Runoff from these areas, which cover much of the residential and commercial area, flows into the storm-drain system’s network of gutters, catch basins, channels, culverts, and pipes. In some cases-for example at car washes-collected water is treated, but in general it flows directly into local streams and on to San Francisco Bay without treatment to remove pollutants. The storm drain system is separate from the sanitary sewer system, which collects wastewater from households and commercial buildings and sends it to a wastewater treatment plant before discharging it into the Bay. We can minimize our impact on the watershed by minimizing the use of polluting substances, cleaning up spills immediately and disposing of them properly. Sweep up dry materials such as cement or fertilizer; don’t attempt to wash them away with water or bury them. Clean up liquid spills on paved surfaces by using absorbent materials like cat litter, sand or rags. Keep all paint wastes including solvents and paint-stripping residues, paint chips and dust, and sandblasting wastes away from gutters, streets, and storm drains. Dispose of these wastes appropriately, either in the garbage if they are not hazardous, or at a hazardous waste collection point. So-called biodegradable products may take months to break down, so such labeling is no assurance of the product’s safety. It is worth remembering that many of the chemicals we are in the habit of using have persistent effects on the environment, and that disposing of them merely passes on the problem to someone else’s watershed. For more detailed information on watershed pollution prevention visit the Marin County Stormwater Pollution Prevention Program web site, www.mcstoppp.org.